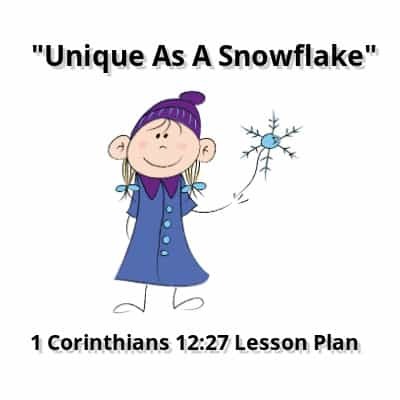 Children's Bible Lesson "Unique as a Snowflake"
This simple Bible lesson is perfect for those Sundays when you have snow on the ground. It could be used in Sunday School or Kids church. Some families could use it as an outline for a family devotion. Gospel Connection: When children look at snow they see individual snowflakes that are all uniquely made, but can make a big impact on the world when they stick together. Likewise, all children are made in the image of God and are unique. As the church, we are the body of Christ and are called to work together to accomplish the work of the church. Learning Aim: Children will learn that they have been made in the image of Christ and that God created them to be unique individuals. God’s ability to create is infinite and He should be praised for the diversity that he created. Children will also learn that made us all unique so that we could world together to accomplish the work of His church. Open the Lesson: Greet the children and explain that we will begin by playing a game called Alike and Unalike. In this game the teacher will give a category and the children must sort themselves based on that category. Say, When I say go, put yourselves in a group with children that have the same eye color as you. Say go and help children put themselves into the appropriate groups. Say, Great! We all have eyes, but they all look different. Now, put yourself in a group with people who have the same hair color as you. Continue the game with categories of shirt color, shoe type, number of siblings, age, favorite color, etc. When the game is finished ask all the children to sit down and say, God made us all unique, that means that we are all different. What are some of the things that make us different from one another? Allow responses. God made us different in many physical ways, such as eye color or height or age, but He also made us different in the ways that we think and act. We all have different likes and act in different ways. Why do you think that God made us all uniquely? Allow for responses and tell the children that we will find out soon. Biblical Background: Read and show Genesis 1:27 to the class. “So God created mankind in his own image, in the image of God he created them; male and female he created them.” Say, God is the Creator of the whole world. There is no end to the things that He can create. He can keep creating more and more things and will never run out of ideas. Human beings are His best creation because He also gave us the ability to think and create new things. We are all created in the image of God, but are very different. Sensory Time: If it is available to you, get a large bucket of snow and place it in either a sensory table, in large bowls, or directly on the table. If you do not have access to snow, you could find several picture of snow from Google images to show the children in place of real snow. Place the snow in front of the children and tell them to look at it closely. Ask, What do you see? What does the snow feel like? What does it smell like? Allow responses and give the children plenty of time to play with the snow. Say, all of this snow is made up of tiny snowflakes. Look very closely and you will be able to see the tiny flakes. Every snow flake is unique. No two are exactly alike, just like no two people are exactly alike. God made them all unique just like we are unique. But look at what snow can do when all the little flakes stick together. Have you ever built a snowman or had a snowball fight? It takes millions of snowflakes to make those things happen. Allow the children to play until they lose interest or the snow melts. Be prepared to clean up the melting snow and warm the children’s fingers when you are finished. to respond, and tell them that there are people who preach, teach, pray, evangelize, care for the babies, clean, cook, manage the money, etc. God made you unique because He has a specific plan for your life and a specific job for you to do in the Church. What can our class do if we all stick together and work together? Allow children to respond and help them come up with ideas of things that they can do to minister to the people in your church. Snow Self-Portraits: Have children create self-portraits that highlight the things that are unique about them. Give each child a dark colored piece of construction and a ‘snow stick’ (white chalk). Have the children draw themselves with the chalk and ask them to tell you what makes them unique. When all the children are finished, hang the pictures on the wall to create a large collage of the class. Remind the children that they are created in the image of God, and that they are all unique. Snowy Review: To play this game you will need a large bag of cotton balls. The cotton balls will represent snowballs. Divide the children into two teams, team 1 and team 2. You will ask team 1 a question and if they get it right they will get 3 cotton balls. Then ask team 2 a question and if they get it right they get 3 cotton balls. If a team answers the question wrong the question goes to the next team. Once all the questions have been answered, have both team build a snow tower out of their cotton balls. Whichever team builds the tallest tower wins. What does unique mean? It means that we all have things that make us different and special. Why did God make us all unique? God made us unique because He has a specific plan for all of our lives. How many things can God create? God can keep creating and creating. He will never run out of ideas. What are some of the ways that God made us different? He made us with different hair and eye color, different interests, ability to do different jobs. Allow children to use their imagination as they answer this question. Can we do more when we work alone, or when we work together? We can do more when we work together. According to 1 Corinthians 12:27, what are we a part of? We are a part of body of Christ. What do the children of God make when we all stick together? We make the church. What are some of the different things that we can do in the church because we are all different? We can be Preachers, Teachers, care for children, keep the church clean, secretaries, etc. Name something that our class can do for our church when we all stick together. Allow the children to use their imagination as they say things that they can do when they stick together. Closing Prayer: Say, Every time that you see snow, remember that God made you unique and has a plan for your life. You are a part of the church and only you can do the job that God has planned for you since He created you to do it. When we stick together we can do great things for the kingdom of God. Let’s pray. Dear Lord, thank you for making all of us different and special and in your image. Help us to always remember that we are special because of our differences. Show us what we can do to bring glory to your kingdom. Amen. Snowball fight: This snowy game is just for fun. Divide the children in half and put a piece of masking tape on the floor to divide the room. Give each team a large bag of cotton balls and let them have a snowball fight. No one may cross the line in the middle of the room. The object of the game is to have as few cotton balls on your side of the room as possible. At the end of the game see who has the least amount of cotton balls to determine the winner. Unique Snowflakes: Have the children create their own unique snowflakes by folding a coffee filter and cutting out small triangles from the folds. When the coffee filter is unfolded you will have some very pretty snowflakes. First, I want to say Thank You for the wonderful lessons and coloring pages!! Please forgive me for being critical–in my work, I have to watch for errors in typing and/or text. I just started reading the lesson, As Unique as a Snowflake, and already found a few errors. I wanted to correct them for you, but changes were not allowed. Other articles/lessons have had errors as well, so I decided to say something. Proofreading is important. Thank you!! Tony Kummer (Editor) reviewed & updated this page on : January 26, 2016 at 12:52 pm. All our content is peer reviewed by our readers, simply leave a comment on any post suggest an update.